The seven branch Menorah or Golden Lampstand, a reminder of the seven days of Creation, was cast from one talent of gold and stood in the Tabernacle of Moses and later in Solomon’s Temple in Jerusalem. 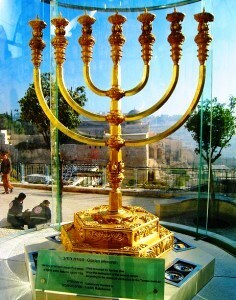 The seven branch Golden Menorah or Lampstand that stood in the Tabernacle & Solomon’s Temple was cast out in one piece. Where was the Menorah placed? God proscribed that it should be placed in the Tabernacle – the portable temple – that the Israelites carried through the wilderness for 40 years, on the way from Egypt to the Promised Land. Later on it was places in the Holy Temple that king Solomon built on Mount Moriah in Jerusalem (“Solomon’s Temple”). Throughout history the Jewish people have incorporated it into synagogue design and today it is the symbol of the modern state of Israel- it’s that important! Let’s look at the meaning of the word Menorah. In most bibles it is translated as Golden Candlestick or Candelabrum. What is so special about it? Why is it holy and what does it represent? How much is one talent of gold? One talent (kikar in Hebrew) is worth 3000 shekels. There are various evaluations of how much a shekel weighs, but if we take an average of 12 grams/ shekel X 3000 = 3.6 kilos. At a gold value of $1,108 per troy ounce = approximately $128,000! The seven branches or lights are not by coincidence. In the Bible, the number seven reminds us of the seven days of creation in the biblical book of Genesis. Seven in Hebrew- sheva – means fullness- to be totally filled and fulfilled. It was indeed what God felt when he finished his masterwork of Creation and His jewel-in-the- crown: Us! And then he “rested” on the seventh day- i.e. kicked back and said “Wow!”. He had humanity to lavish his love upon, with the hope, since we were created in His image, that we’d turn around and to the same with each other in fulfilling the commandment “love your neighbor as yourself”. What is the significance of the lights? The name “menorah” comes from the Hebrew root meaning “light” . So the emphasis is not on the actual candle holder but on the subject of “light” within the biblical creation story of the seven days. Indeed, the first thing God did – on the 1st day was to create light- “Let there be light!”. What kind of light was it? Not necessarily a physical light, but more importantly the Divine Light – which increased day by day throughout the Creation story as God planted himself in every nook and cranny of Creation- until it was All Pervading- as represented by the Menorah. But God’s menorah is not candles or oil lamps- it is people. Indeed in the book of Proverbs it says, “The spark, the lamp, of God (i.e. the divine light) is the soul of man.”. In other words, we, each human being, is a divine light, carrying the divine spark that was created on the 1st day. Through our actions we can choose to increase the divine light within ourselves or diminish it. The choice is ours, in the way we conduct our daily lives. What happened to the original Menorah? When Titus burned down the Holy Temple in Jerusalem he looted it and removed the Golden Lampstand. It was then paraded through the streets of Rome along with Jewish prisoners of war as depicted on the Arch of Titus near the Colosseum in Rome. His father Vespasian deposited the Menorah together with the other booty in the special temple which he erected after the Jewish Revolt against Rome in the years 66-73 AD. (Josephus Flavius: Wars 1:148-50) The subsequent fate of the Golden Lampstand is uncertain. It was probably melted down since it was made with 1 talent (3.6 kg) of pure gold. For the first time in 2000 years, a gold replica of the original Menorah has been cast and put on display in Jerusalem! Contact Zack Shavin, veteran guide and biblical archaeologist at Land of Israel Tours, about viewing it and other sacramental vessels, including the High Priest vestments that were used in the Tabernacle of Moses and Solomon’s Temple. This entry was posted in Themes & Traditions and tagged Creation, Golden lampstand, Jerusalem, Jerusalem Temple, Menorah, Solomon's Temple, Tabernacle by zshavin. Bookmark the permalink.